Some may find it hard to believe that it has been 14 years since the original Incredibles first lit up our screens. With its perfect mix of endearing characters, riveting action and a memorable Michael Giacchino score, it was truly a landmark, not just as an animated feature, but also as a full blown superhero movie. Even after its successful romp in the theatres, the movie has barely gone off air, routinely showing up on just about every movie channel on television. Therefore, it was hardly surprising that kids of all ages (and a good number of adults) were waiting with bated breath for the sequel. Right from the opening scene, Incredibles 2 is a fun romp. 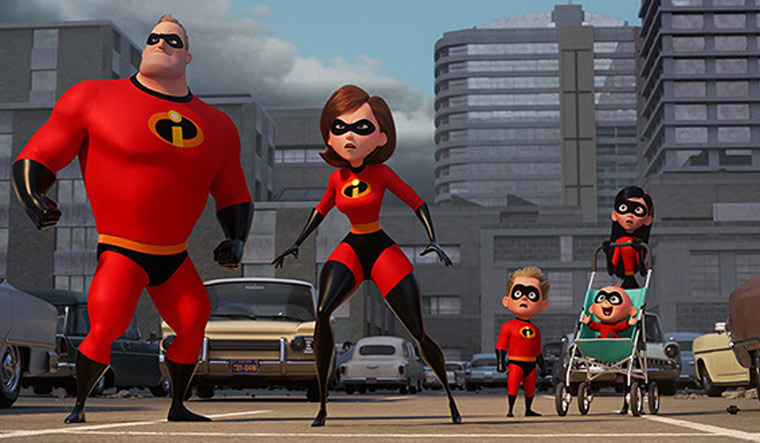 Picking straight where the original Incredibles left off, the Parr family—Bob, Helen, Violet, Dash and Jack-Jack—are thrust straight into action, as they face the notorious Underminer, in one of the film’s most breathtaking action set pieces. However, much like in the first movie, the public opinion is still very much “anti-superhero”, mainly due to the messy consequences of their crime-stopping endeavours. This not only prevents the family from engaging in their usual exploits, but also forces them to live in a cheap motel. Things change when mysterious benefactors, Winston Deavor, an enthusiastic tech magnate, and his languid sister, Evelyn, offer to return the superheroes to their former glory, through a mix of crime-fighting, and more importantly, good PR. This is where the movie diverts into its two main storylines—one with Bob navigating the daily struggles of raising three children, and the other with Mrs Incredible, who due to her diminutive disposition, is tasked with all the crime-stopping responsibilities. In a classic ‘gender reversal’ storyline, we see Bob hilariously trying to adapt to life as a stay-at-home dad. Between babysitting the wildly unpredictable Jack-Jack, patiently listening to Violet’s relationship troubles, and helping Dash with his homework, the macho Mr Incredible has his hands full, and hilarity ensues. This entire storyline is thoroughly enjoyable, with Jack-Jack stealing the show. Possessing a plethora of different superpowers, his interactions with the rest of the family are some of the film’s best moments. The scene in which he is provoked into using his powers for the first time, is a stand out and one of the funnier moments in any Pixar movie. Mrs Incredible, on the other hand, is thrust back into the superhero life. Set with the task of restoring the reputation of superheroes, she initially impresses, wowing the public with her heroic exploits. However, when she faces up against the mysterious computer hacker, simply known as Screenslaver, trouble boils up. The whole plotline is very reminiscent of the first movie. My only gripe was the way in which the villain was written, and to a lesser extent, the screenplay as a whole. The story faithfully follows all the usual superhero beats, and barely takes any risks. This could be the result of the innumerable superhero movies that have flooded the market in recent years, conditioning our minds into knowing exactly what to expect. The main villain was also far too underwhelming, unlike Syndrome from the first movie, who was well-rounded and at times even relatable. In particular, there was a scene where a major reveal regarding the villain took place, which almost the entire theatre saw coming a mile away. As usual, Brad Bird’s direction was sublime. The animation virtuoso was quoted saying he would make Incredibles 2 only if he thought it could be as good as the first. He has certainly stood by his word. Like most of his previous movies, Incredibles 2, while being aimed at children, has a deeper meaning that transcends all generations. The visuals are also stellar, with the animation in each scene achieving a level of detail unlike anything we have seen before. On the whole, some minor complaints would not be enough to steal away a thoroughly enjoyable story and gripping action scenes. Incredibles 2 is well worth your time if you even remotely enjoy superhero, action or animated movies, and is about as entertaining as any movie you’ll see all summer.